Nov. 1, 2017 4:00 p.m.
Qualicum Beach was filled with parents and children dressed up for the annual Halloween festivities in the village on Tuesday, Oct. 31. Cloudhead Games, along with the Town of Qualicum Beach, hosted the second annual haunted house at the old fire hall. 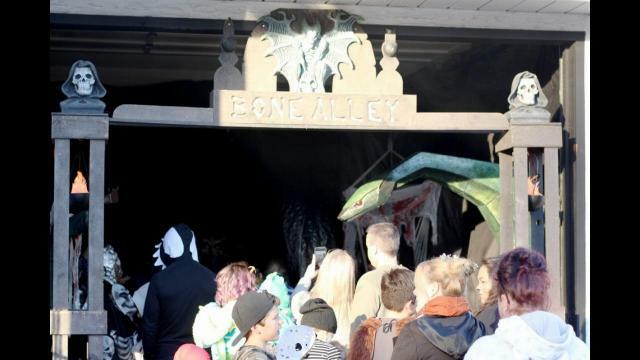 From 3-9 p.m., Cloudhead general manger Tracey Unger said more than 1,200 people went through the haunted house and more than $1,300 was raised for Manna Homeless Society. Reporter Lauren Collins and editor J.R. Rardon went through (and survived) the haunted house.